October is the perfect month to unveil the newest Catalog from Azrak Hamway Internationl (AHI). Why? 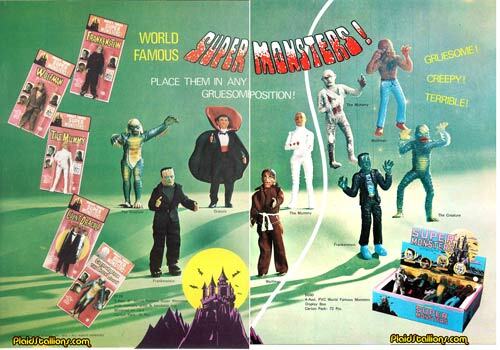 Because that's the year that the 70s Rack Toy Giant decided to license the Universal Monsters transforming thousands of us unsuspecting children into monster kids! 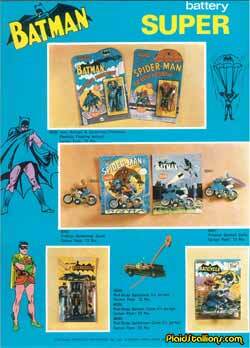 Combine that with more Superhero stuff you can shake a stick at and you've got the makings of a happy childhood! 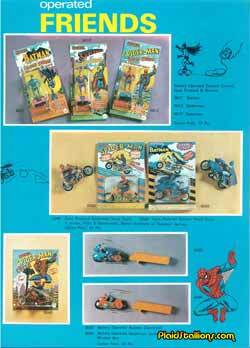 Visit the 1974 Azrak Hamway Toy Catalog here. That catalog is soo cool!! I remember getting the AHI Mummy with the arm bandaged to the chest, back in '74 ( I was 7). It had really bright white wraps and big shoes. I was in awe when i opened the package. I have one now with the off-white wraps (loose) in my collection. This is the first time i have seen the one with the bright white wraps and bandaged arm in a package. I can't wait to get your book, thanks for writing it! Revenge of the Lincoln Monsters!